1. Preheat the oven 200°C/390°F. 2. Cut the tops off the peppers and deseed them. 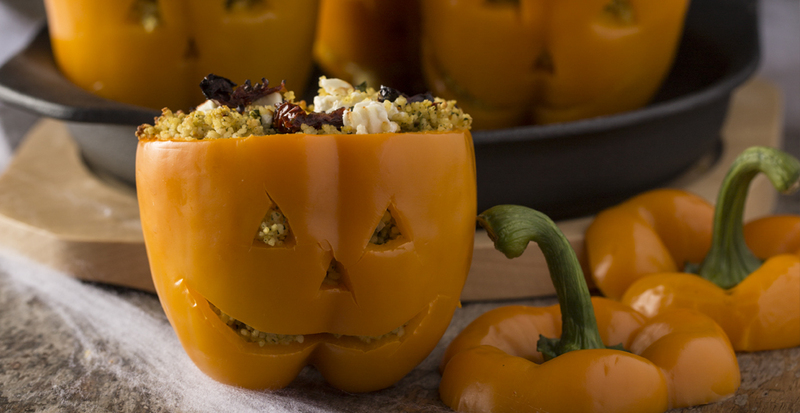 Carefully cut eyeholes and skeletal grins in the front of each pepper with a sharp knife. 3. Put the couscous in a large bowl with 300ml/1.25 cups of boiling water. Stir and cover the bowl before leaving it to stand for roughly 10 minutes. 4. Drain the couscous and then mix it with the feta, basil, olives, tomatoes and pine nuts. 5. Stuff the mixture into each pepper and place the pepper tops back on. 6. Place them on a Cast Iron Dish in the oven and bake for 12 minutes.